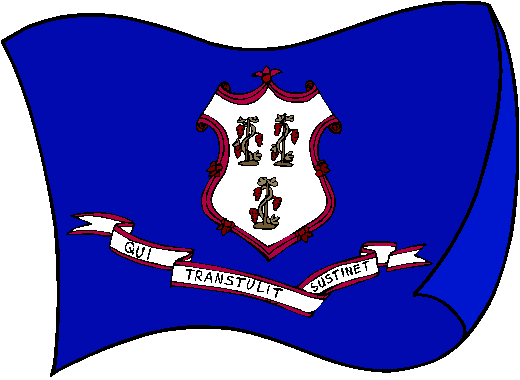 The flag of Connecticut consists of a white shield with three grapevines (each bearing three bunches of purple graps) on an azure blue field. A banner below the shield contains the state's motto, "Qui Transtulit Sustinet" which means "He who transplanted still sustains". The flag was approved by the state's General Assembly in 1897. The design originates from the seal of the Saybrook Colony which was established in 1639. The 1639 seal contained 15 grapevines and a hand in the top left corner with a scroll containing the motto written as "Sustinet qui transtulit". When the Connecticut colony bought Saybrook in 1644, the design transfered to them. The modern design was introduced in 1711 by reducing the number of grapevines to three, and rearranging both the word-order and position of the motto.